With a cast list that reads like a dream and a director who once wrote for us such gems as The Da Vinci Code, I Am Legend and A Beautiful Mind, one would have thought that Akiva Goldsman's A Winter's Tale would blow one's mind. It does, actually, but not in a very nice way. This tale, set in winter, is not only depressing, but also flippant and makes very little sense. 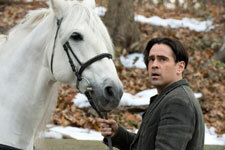 There is a man (Colin Farrell) in present day New York, who does not remember his name. Every day, he sketches in public places a redheaded woman who stares at the moon. He has no clue why. And then he runs into Abby (Ripley Sobo) and her mother Virginia (Jennifer Connelly). Later, when he remembers snatches of his previous life, he takes Virginia's help to trace the people he thinks will help solve his dilemma. Only, they have all been dead a hundred years. Not only that, the man himself has not aged in over a century. Is he an immortal? That is not explained, but what transpires is this - Peter Lake, for that is the man's name, is an orphan and a thief in New York, 1916. He has some problem with his sinister boss, Pearly Soames (Russell Crowe). Peter is on the run, and when he breaks into a house that seems locked, he comes face to face with Beverly Penn (Jessica Brown Findlay), who suffers from consumption. Peter leaves, but he is already in love with Beverly. Pearly Soames, in the meantime, seems to have some supernatural power that helps him identify Peter's weakness. He tries to kill Beverly, but Peter rescues her in the nick of time, and takes her to her family in the countryside. Pearly then goes to meet his boss, Lucifer (Will Smith), which is when it becomes clear that he is a demon. Lucifer is, of course, Satan. Pearly asks for permission to cross into the countryside, but Lucifer rejects his plea. It is imperative that Peter is stopped from performing his predestined miracle, and for that, his destiny, Beverly, has to be killed. After much melodrama and cloying romance, the screenplay remains ambiguous about Peter, but one presumes he is an angel, and Pearly the demon was trying to turn him. Peter is still alive a century later because his destiny has not been fulfilled, or that is the impression one gets. The story never explains why Peter's immigrant parents, who were denied entry into the United States, set him adrift, and how much they knew of his fate. It also fails to explain how Beverly's sister, Willa, who was about 10 years old in 1916, is alive and kicking in 2014, and running a newspaper, no less. Also, if Peter has a companion in the angel White Dog or Athansor, a white horse, why does he let himself be captured? Why can he not just fly away on the horse? The most jarring bit in the script is the romance between Peter and Beverly - it is almost nauseously sweet. The lack of chemistry does not help, and Peter looks more like a letch than a hero when he gets physical with the terminally ill Beverly. The icing on the cake is how easily Virginia accepts the idea that Peter can be a man from a hundred years ago. The characters are one-dimensional and have no gravity. The dialogues do not make things better. In short, the story lacks a plot, and that is surprising, considering that it is based on a bestseller of the same name by Mark Helprin. All the actors in the movie obviously owe some of their best roles to Akiva Goldsman, which is why they agreed to act in this senseless movie. There can be no other explanation. The result, however, is a listless performance by each, and can get tiring. Colin Farrell is just not interested in his character, and this has to be his worst role ever. Jessica Brown Findlay is too sweet, and irritating. Russell Crowe is suitably menacing, but is let down by the part he has to play. Jennifer Connelly looks like she is in shock. Ditto for William Hurt. As for Will Smith, he deserves the Razzies for this movie. He is so uninvolved with his character that you have to blink to make sure that it really is him in a dreadful cameo. The production design, oscillating between the early 20th century and the present, is decent, especially the costumes, but the incredibly lacklustre plot distracts you from that. The cinematography suffers a similar fate. The movie is almost two hours in length, although the story could have made more sense if the editing was crisper. The classical music is a relief, and one has Hans Zimmer to thank for that, but there is a lack of variety. A Winter's Tale has an amateurish beginning, a yawn-inducing middle, and an incredulous end. If the director's intention was to play on the theme of religion by giving demons and angels humane characteristics, there are many ways he could have gone about doing it. If he wanted to adapt a popular book into a screenplay, then he should have stuck to the original flow of narrative, and made the movie more believable. This movie falls into no particular genre, and is tedious and ridiculously tiresome - definitely avoid. Be the first to comment on Winter's Tale! Just use the simple form below. fullhyd.com has 700,000+ monthly visits. Tell Hyderabad what you feel about Winter's Tale!